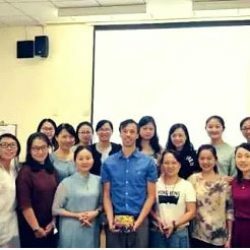 The third German-chinese Training Course on Psychosomatic Medicine took place from the 12th to the 16th of september 2017 in the SMHC in Shanghai under the leadership of Dr. Chen Jue who is the director of the psychosomatic department there. Again more participants were applied than we could register and even this time we decided to take these participants that came as a group from different occupational category from one hospital. Again we had again over 20 nurses, that were applied with high engagement. 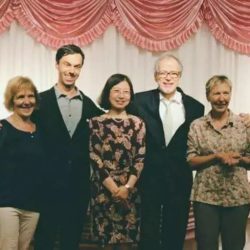 The schedule of the 5 days was again like last time with the beginning in the morning with a altogether lecture: Psychosomatic inpatient therapy –concept; Pain disorder; Eating disorder; Team; Depression. Afterwards deeper discussion in the small groups (doctors and psychologists, nurse, art therapy; CMT-group, then the different group activities as described later. In the evening we had again the integration, i.e. 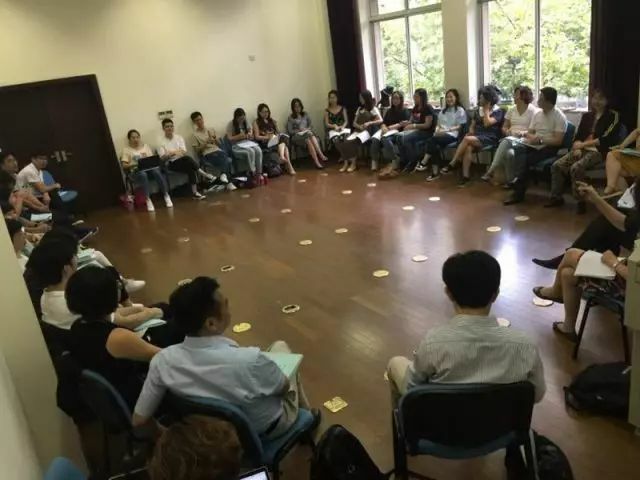 the big balint group which was organized in an outer group and an inner circle. This was the finish of each day with 11/2 hour. In this group there was the leader and about 100 pariticipants. This resulted in a high emotional tension and enabled an integration of the whole group. 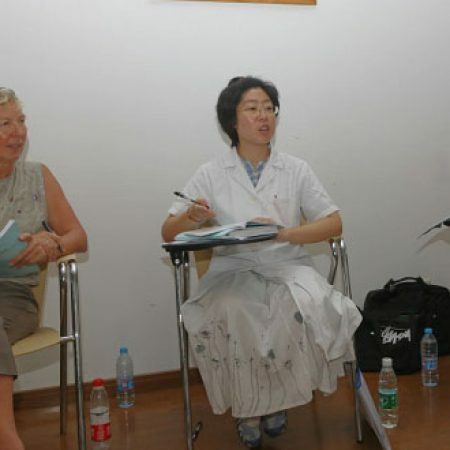 As in the last sessions in these case reports a lot of very topical subjects of the Chinese psychosomatic came to the surface. The last case showed the 13 years old boy of very reach parents, who collapsed under the pressure to get fit for an American university. 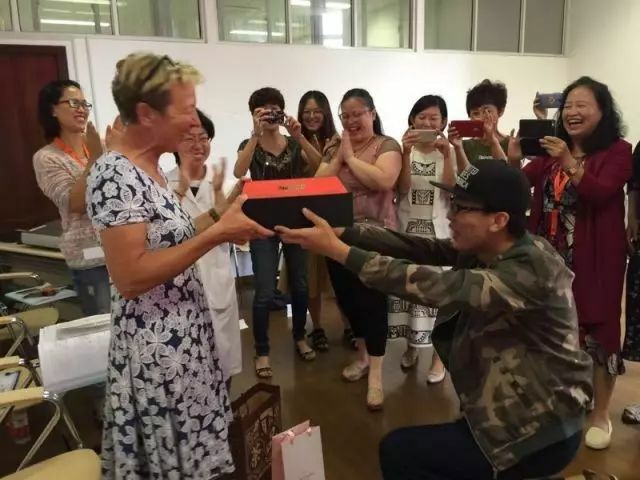 He had spent the years 2 to 6 in a boarding kindergarden. He couldn’t cope this separation of the parents during the whole week. 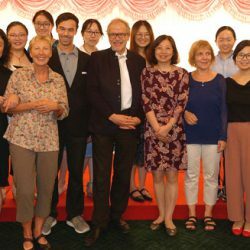 A special highlight in this year were the lectures oft wo teachers from Germany and China who are leading of their professional associations of their country, Prof Dr. J. Kruse (Giessen, Marburg) who is the president of the german psychosomatic association. 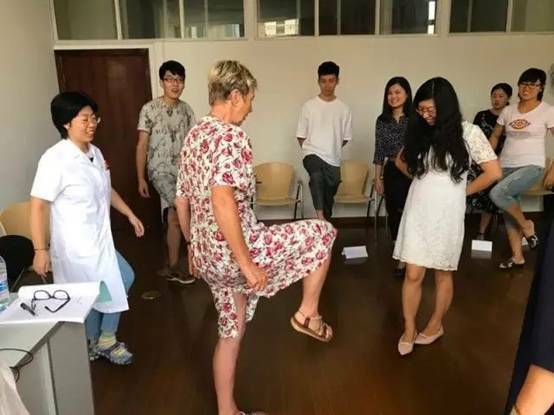 Full of motivation and curiosity 19 participants started their training each morning at 8.30h in Shanghai at Mental Health center with a daily morning lecture- quite an unusual week for nurses. Some of the participants travelled for the first time of their life to another city, mostly by train-because it is not so expensive. 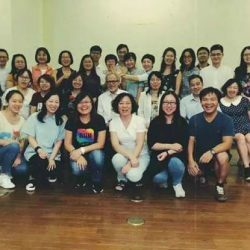 Some of them had more than 20 or 30 years experience in their profession, working in psychiatric or even psychosomatic wards. One nurse works with eating disorder patients in a very professional manner. Also very young nurses were belonging to the group. We had two young male nurses, both working in psychiatric hospitals. From the beginning the participants were interested in each other and learned from each other. Very soon we became a group with a confidently working atmosphere and a lot of questions; second thoughts were reflecting. Based on the daily morning lecture we could easily step in the particular topic of our curriculum. Depression was the topic of the last day. The majority of the group was well educated in this disease and one nurse introduced a professional diary for depressed patients. 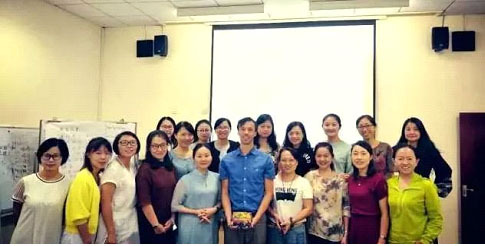 Also working with pain patients was familiar to them including a collection of skills how to deal with this patients and their symptoms.Contrary to my expectations only a few members of the group were experienced with the topics Eating disorders and Borderline personality disorders. But when we talked about it they recognized and identified some of their patients. They improved their capacities in introducing their results for the whole group- so they even got more self confidence. My favorite parts were our role playing games. 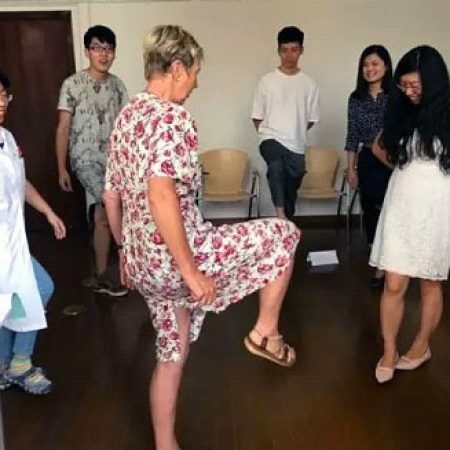 Although laughing a lot, the group understood very well and I am still astonished that there was no problem to understand. Our common values of all of us were the respect and acceptance of our patients. 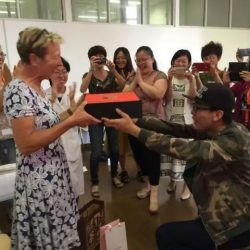 So we all spent a concentrated study-week and sometimes I had to remember me that these colleagues came from the other side of the world. 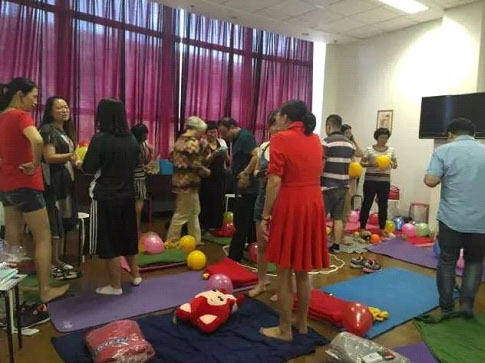 This time there were 22 participants in the CMT (concentrative movement) group, mostly psychiatrists, psychologists and also some nurses, coming from different regions in China. 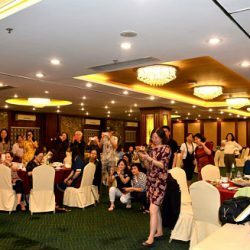 Some of them had already joined our program in the previous years in other working groups. Now they wanted to look at the same features from a new perspective. 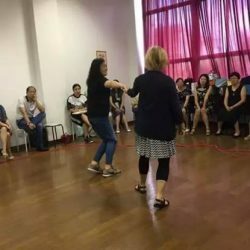 Everyone was eager to learn and understand more about psychosomatic treatment and the approach of awareness and movement. I introduced some theoretical background of CMT , but soon we got into the practical part, since movement therapy is, of course, based on the personal experience. So many topics to work on, so many questions to discuss. 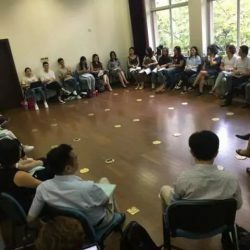 Since there were so many participants in the group I chose to let them work in small groups or pairs of two most of the time, in order to provide a lot of time for personal experience and exchange. 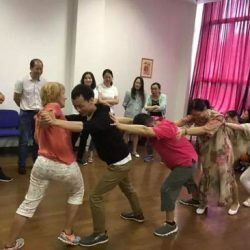 We explored the feeling of connection and disconnection, how to interact with a depressed person and also the value and importance of security and self-expression. A very important topic was the issue of boundaries, not only for the patients, but for the therapists themselves. We also looked at the characteristics of the self image in certain psychosomatic diagnosis, for example eating disorders. We used all kinds of materials, like balls, ropes and o lot more, as symbolic features and possibility to become more aware and able to differentiate. Every day we had a certain topic, mostly introduced through a morning lecture by Dr. Merkle and one morning by Mrs. Schopf. Those topics, like pain disorders, depression, eating disorders a.s.o. 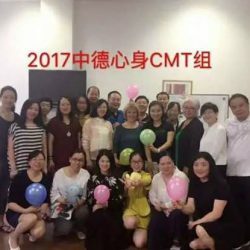 were discussed in the CMT group as well. And then we “translated” the symptoms and their characteristics into practical exercises. 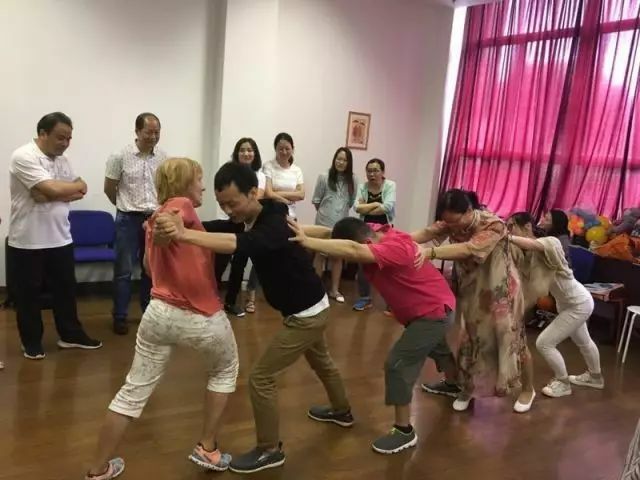 We started every session with a little warmup, becoming aware of our body, senses and emotions; very much liked by the group members. Like the two years before I enjoyed the vividness, the curiosity and the creativity very much. Everybody was eager to learn, very open minded and discussing on a high intellectual level. So the five days seemed to pass by very fast. 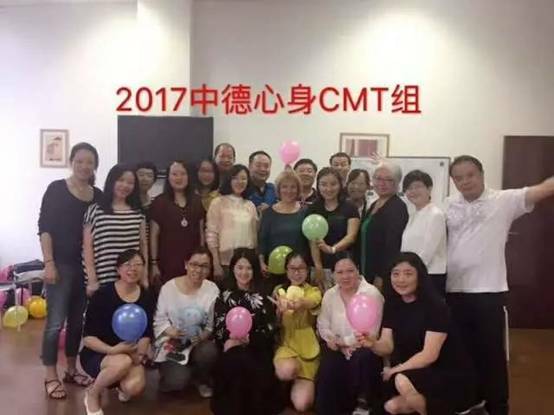 The CMT group had to separate, hopefully taking home some important and valueable experiences for themselves and their work. 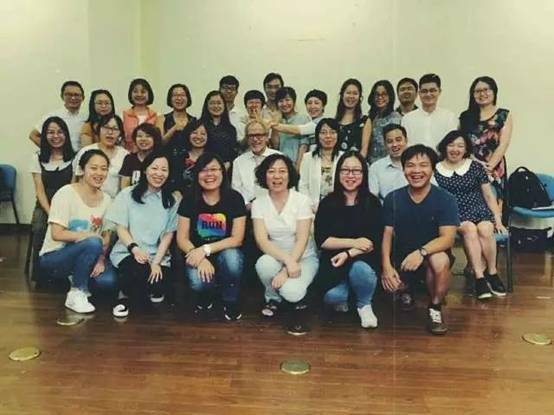 For myself I was very touched by the warm hearted and respectful feedback from my group members, feeling connected and also having learned a lot through working with them. 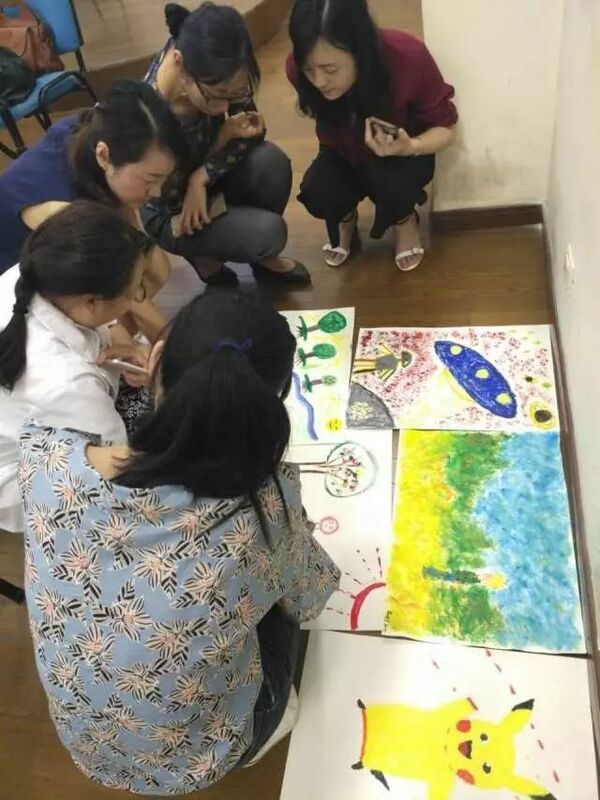 The 22 participants came from all over China, with a different and broad professional background: there were psychiatrists, psychologists, a sand-play therapist, a social worker, a music therapist and art therapist s. They all were very interested to learn something about art therapy in general and off course specific about art therapy in psychosomatic medicine. Some participants specifically wanted to learn new ways to get into contact with their patients, because they felt that spoken language was not sufficient to reach some of their patients. of the exercise was. This was followed by giving some theoretical input about the topic of the lesson (e.g. eating disorders) and by examples and pictures from my work with patients (e.g. 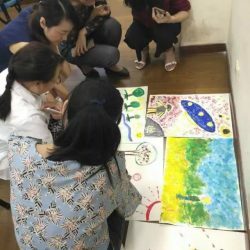 what patients with eating disorders do in art therapy), so the participants were able to look at those pictures with a deeper understanding. We started with a simple drawing exercise: Draw three different objects on a sheet of paper. 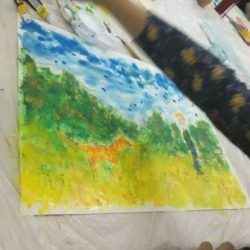 Actually, it was more a training of perception, because after drawing we sorted the pictures by different criteria and thus looking at the same pictures again and again in very different ways. We found similarities and differences between pictures, we searched for dominant aspects and for weak parts in a picture, and we looked for clarity and chaos in the pictures and many other aspects. Training the perception was a task I followed throughout the workshop. When I showed pictures, I involved the participants and their observations by asking questions: What do you see? What is in the focus of the picture? Do you see this little detail? But this was just the first step – our perception of a picture. The second step was, how a picture impressed us, what we thought about it, how we felt about it, what kind of associations a picture evoked. 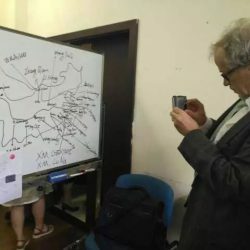 In these five days of the workshop, looking at pictures, describing pictures, talking about our observations and our perceptions was a heavy focus of the training, but only one part. The other parts were theory (about specific disorders or about psychodynamics) and the most important part: exercises and self-experience. It was very nice to see, how the group opened up from day to day, and how the restraint, some participants had in the beginning, became less and less with each exercise. It was a very vivid and interested group and the participants were eager to explore the different materials as well as the different creative tasks and topics and of course they were all intensively discussing their experiences in the following reflections. 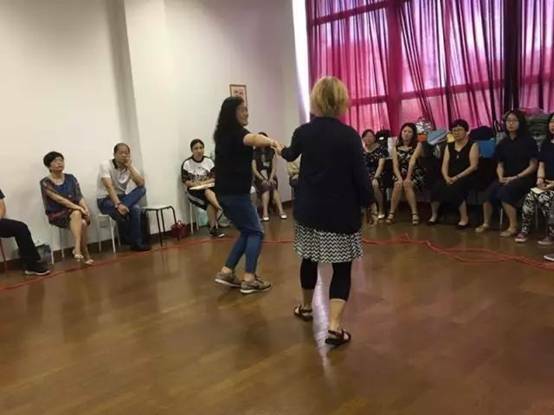 As the group was quite big I separated them into small groups of five participants for the reflection of the exercises and it was very interesting to see that it became more vivid and joyful the smaller the audience was. I very much enjoyed working with the group; they were all involved, deeply interested, asked good questions and gave valuable feedback. I had two very good translators who did a nice job, so it worked all very well. 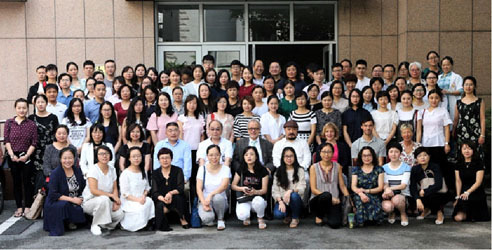 The group of doctors and psychologists this time was very big with 30 participants. 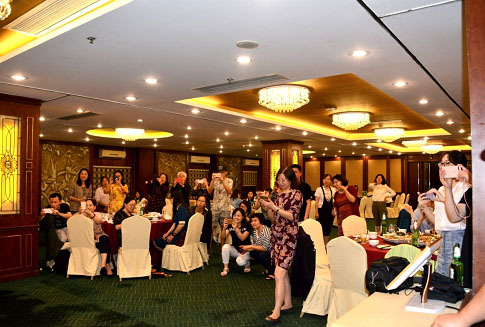 There were participants from all over China: Fujian, Guizhou, Shanghai, Hangzhou, Hunan, Qhinghai, Xuzhou, Zhejiang, Jiangsu, Xiaoshan, Jinan (Shandong Province), Dazu, Chongquin, Henan, Kunming, Tianjing, Liaoning, Inner Mongolia, Xi’an, Jingan. Also this team we had complete groups from the same hospital. 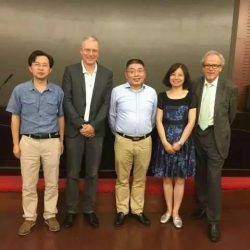 There were a lot of very interesting discussions, case discussions and a deep exchange concerning the developments in China and Germany. 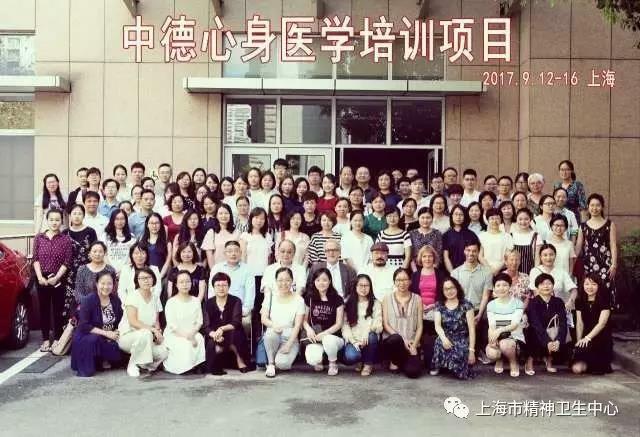 Very interesting the fact that at many places in China there are coming up Psychosomatic clinics, especially in internal clinics not only in psychiatry. But there is a lack of educated employees, supervisions and a special education for doctors and nurses. 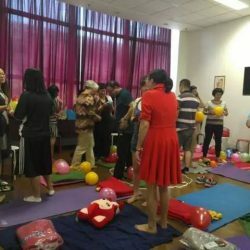 Almost totally is the lack of art therapists and CMT-therapists (concentrative movement therapy). 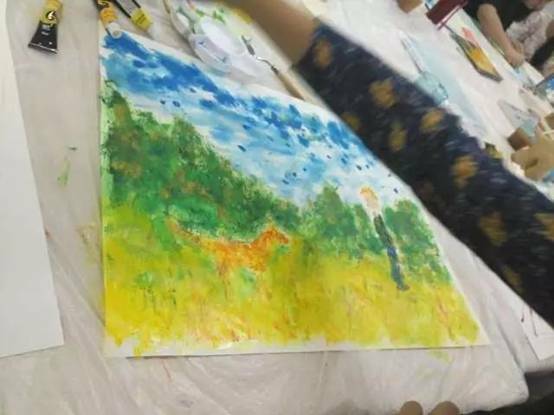 This therapeutic art therapy facilitate an approach to unconscious conflicts, enable the creativity and the development of binding and emotional enrichment of these poor emotional developments of this patients. Also there is almost no education for CMT. 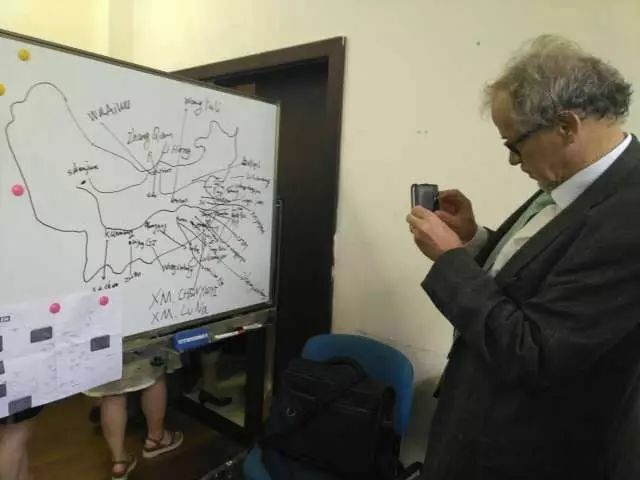 The last day we had a discussion about the multiple wish of participants to have skype case discussions and to continue in this way the work of the group. 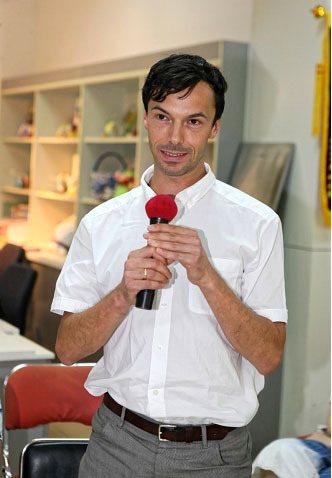 In each case there was a wish for an advanced group and we promised to try to establish this workshop in 2019. 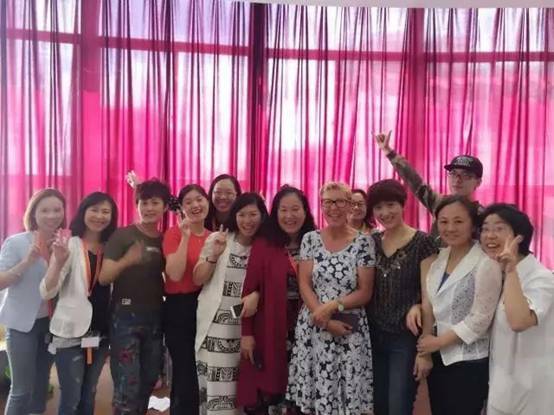 The work in the doctors group was so successful also because we had with Wu Chunyan a translator who had a wonderful capacity of simultaneous translation. 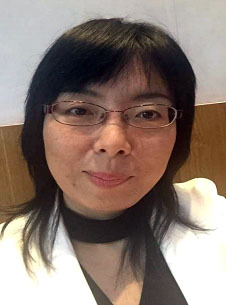 This was possible because she is not only good in English but also she has deep knowledgement in psychosomatic medicine. 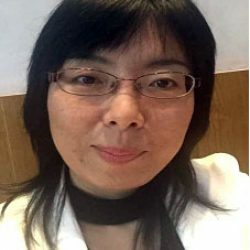 Many thanks to her! Of course also the social part of the training had his place: There was a Party. 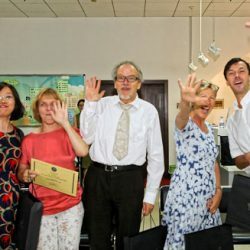 The german teachers not only gave a song of the Shanghai hymn but they also gave some common songs i.e. from the Beatles. 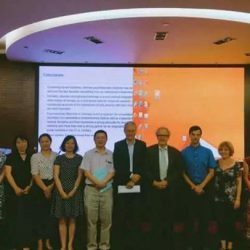 The third Chinese-German Psychosomatic Medicine Training Program was held in the Shanghai Mental Health Center from September 12, 2017 to September 16, 2017. 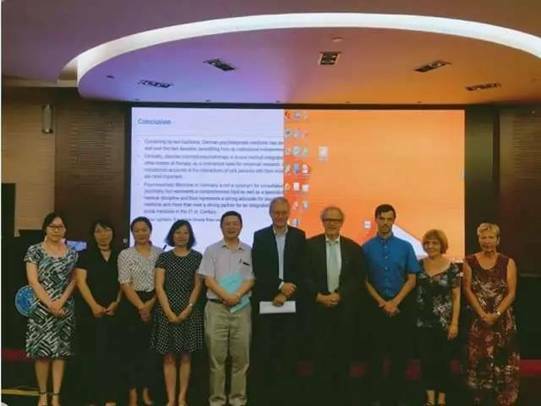 The project was jointly organized by Shanghai Mental Health Center, the German-Chinese Academy for Psychotherapy(GCAP) and the Chinese Mental Health Association. 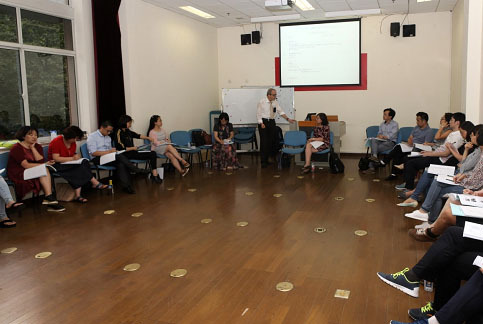 Prof. Wolfgang Merkle and Dr. Jue Chen are the Principles of this program. 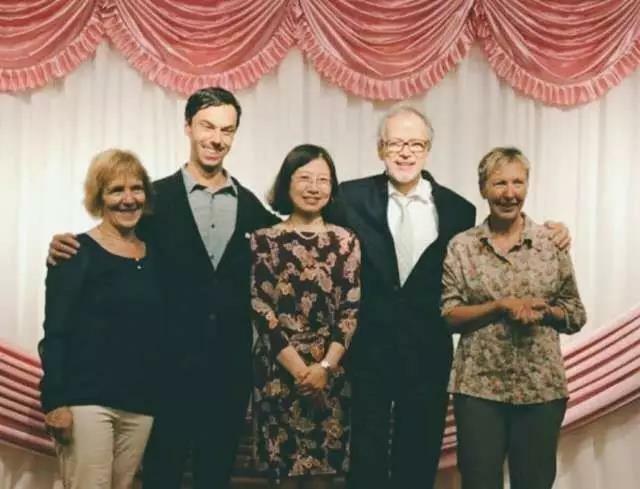 We invited a famous German psychosomatic treatment team of Hospital zum heiligen Geist, a teaching Hospital of Frankfurt University in Germany, to be the faculty of the program, including director Professor Wolfgang Merkle, Nurse-in-chief Miss Gudrun Schopf, CMT psychotherapist Miss Andrea Wolf-Aslan and art therapist Mr. Helge Ostertag. On the first morning, we held an opening ceremony, a bunch of specialists in psychology attended the ceremony, Yifeng Xu, dean of the Shanghai Mental Health Center said, “Welcome to Shanghai mental health center to attend this training. 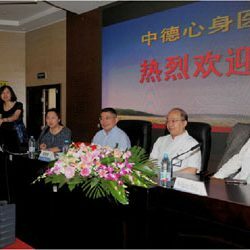 The training program this year is the largest ever, and it is presented in the form of team work, and I wish everyone will have a good time here and learn useful skills!” Yonggui Yuan, the chairman of the Chinese Mental Health Association said, “We all know that psychosomatic medicine originates from Germany, so it’s our pleasure to learn the most advanced psychosomatic treatment concept from the team leading by professor Merkle. 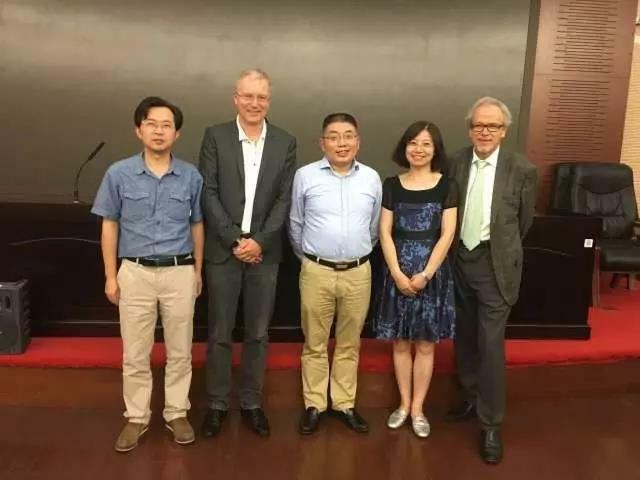 Wish the project a great success!” Professor Wolfgang Merkle, the German President of DCAP said, “Shanghai is a warm family to me and it’s a good platform for us to communicate and exchange ideas. Psychosomatic medicine is a very interesting topic, it combines our body and spiritual world, and it has a great impact on clinical departments. 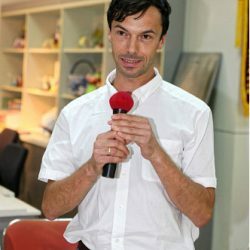 I hope this project is beneficial for you, so that we can provide more professional treatment for the patients.” All the students were inspired by the great pioneers. 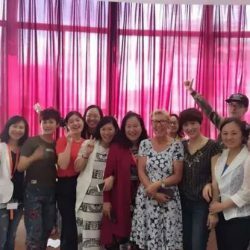 After the ceremony, the students were devided into 4 groups: doctor group, nurse group, CMT therapist group and art therapist group. 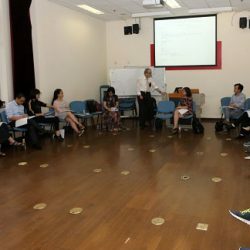 The daily training contained four parts: morning lecture, evening speech, group discussion and Balint group discussion. 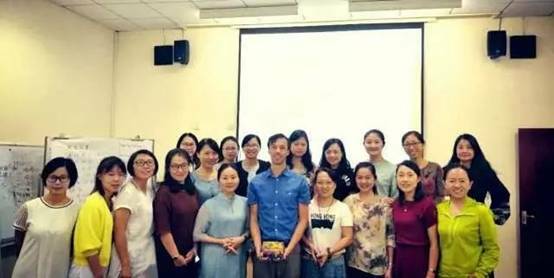 In the morning lecture, we learned the basic theory of psychosomatic medicine and the common diseases in psychosomatic ward, e.g. depression, pain disorder, eating disorder, PTSD, etc. Then we formed different groups, i.e. 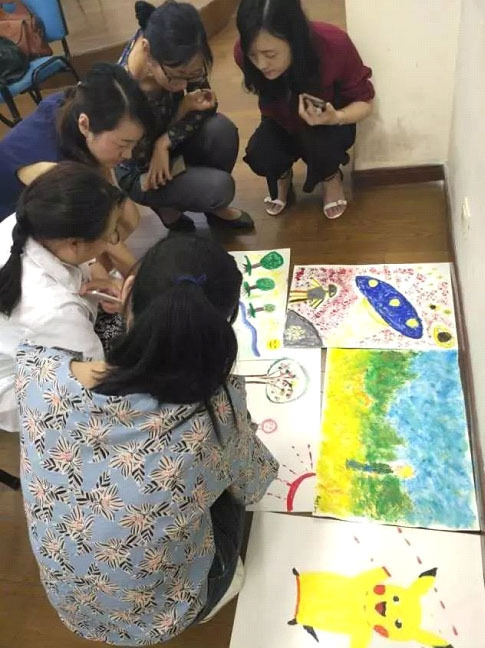 doctor group, nurse group, CMT group and art therapy group, which have different focus, to talk more about the theoretical issues and then have the specific related skill training of the day. 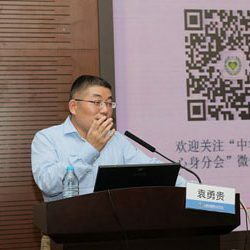 In the first evening, Prof Yonggui Yuan showed us the future of Chinese psychosomatic medicine. And in the second evening, Prof Johannes Kruse gave us a wonderful speech, introducing the origin and the development of Psychosomatic in Germany. At the end of the day, we came back together to have a case discussion in the form of Balint Group led by Prof. Wolfgang Merkle. All of the participants joined it very actively, which made the whole group integrate the pieces of the patient and form the complete picture of the patient. 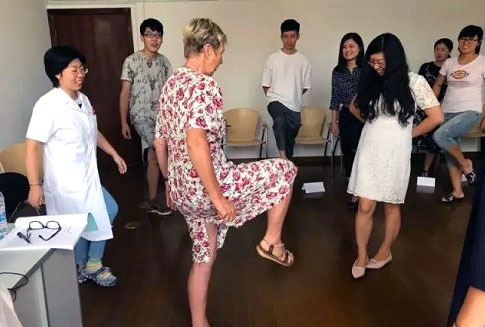 The participants were surprised by such beautiful and effective way to understand the patient. The feedback questionnaire shows that 99% of the participants thought that the content of this project has involved the latest development, achievements or the problems need to be solved urgently in the field, 100% of the students thought this program was very rewarding, especially in expanding horizons and improving skills, 100% of the students satisfied with the content. 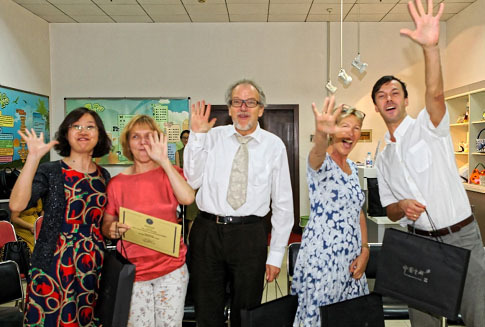 All of the participants appealed strongly expressed that they are excepting the advanced training, and looking forward to seeing all of the German teachers again in Shanghai. 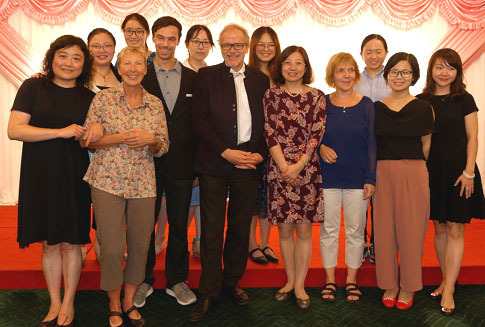 The program is designed for Chinese physicians and psychologists practising in a clinical field who wish to obtain theoretical and practical competence in psychoanalytic oriented (psychodynamic) psychotherapy in the German-Chinese training program. 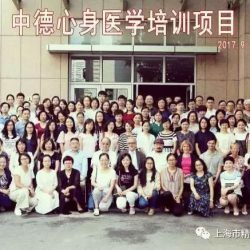 psychoanalytic oriented (psychodynamic) psychotherapy by the German-Chinese training program. 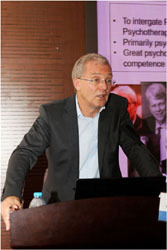 The aim is also to obtain special knowledge and practice in psychodynamic group psychotherapy. 5. 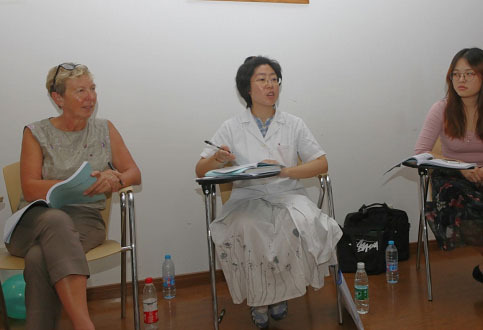 Beijing Cancer Hospital: Communication skills training for medical doctors. 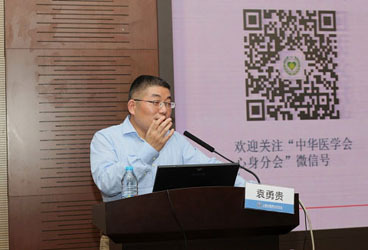 Mental and psychosomatic disorders such as depression, anxiety, and somatoform disorders have become the most frequent non-lethal health problems in China. This makes early diagnosis and effective treatment exceedingly important. 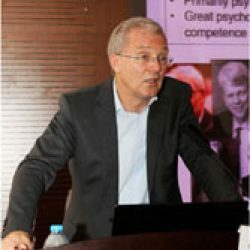 The department of Psychosomatic Medicine and Psychotherapy of the University Medical Center Freiburg (Prof. Wirsching, Prof. Fritzsche) is highly experienced not only in treating mental and psychosomatic disorders, but also in qualifying medical professionals through an internationally approved training curriculum. 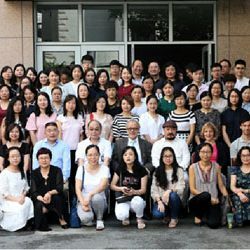 Prior research studies in cooperation with Chinese partners have shown a number of important cultural similarities and differences in, among others, doctor-patient-communication, diagnosis, and treatment approaches. 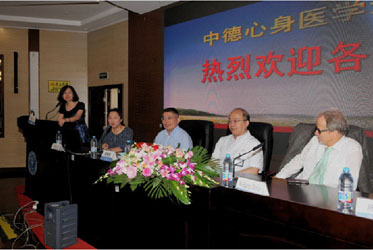 Integration of Traditional Chinese Medicine (TCM) may provide important new impulses, for instance, for research development in the treatment of somatoform disorders and pain. 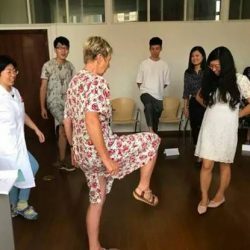 The program is designed for Chinese physicians, psychologists, social-workers and mental health workers, practising in a clinical field who wish to obtain theoretical and practical competence in a psychodynamic orientated body-psychotherapy in the German-Chinese training program. For more details please have a look at the curriculum-PDF.